Think of Santa and the first thing that comes to mind is a jolly fat man. Jolly is an optimum word there. What you least think of for the role is an aggressive and threatening person like Hollywood actor Liam Neeson. Which is what makes this skit from The Late Show with Stephen Colbert so amusing—and terrifying. 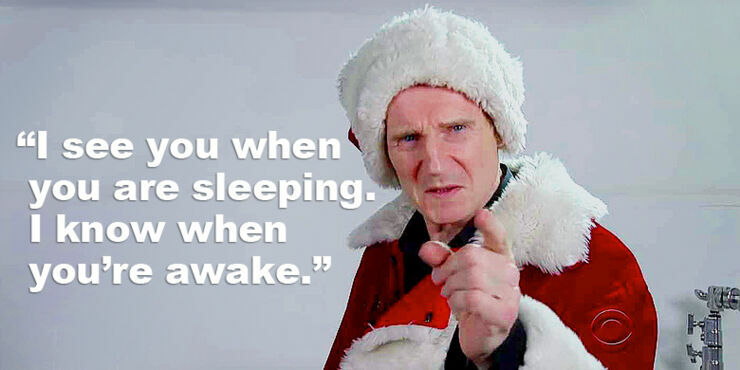 It features Neeson doing a mock audition for a mall Santa Claus but he's not channelling anything near jolliness. Instead the Taken star is showing off how dark and menacing his Santa can be. He's supposed to be reading festive carols to the camera, but his interpretation leaves something to be desired. Because he growls out the lines and his delivery of "I see you when you're sleeping" is downright sinister, flipping the phrase on its head. It will chill you to the bone. It's obvious that poor Liam can't help but revert to it. The director than has the balls to tell Neeson to keep it jolly, but Neeson's having none of it. Later justifying his take on Santa by saying, "Do you understand what Santa's saying here? He's making a list, naughty, nice, he's detailed. He's single-minded. He's an eye in the sky bringing swift judgement." That's his motivation. But, of course, a skit with Neeson wouldn't be complete without a reference to his famous line from Taken. So later we get: "Let me tell you something about that reindeer that ran over grandma. I will look for him... I will find him... And I will kill him." Ho, ho, ho. It's kinda hard to imagine the kids warming to this Santa. He also does a festive nod to his "Release The Kraken!" meme to round things off. But, as terrifying as Neeson's Santa may be, it makes you almost want to see an action movie of his badass interpretation, one which sees him kicking the crap out of some bad guys, lets say the Grinch and his goons, who have stolen Christmas. Maybe that could be the plot of Taken 4.